Altered Instinct: FREE STORY: A Matter of Perspective, by Leo McBride. Inspired by artwork from Ian Bristow. FREE STORY: A Matter of Perspective, by Leo McBride. Inspired by artwork from Ian Bristow. Ian Bristow is a very talented artist. He's an author too - and an active member of the Sci-Fi Roundtable Facebook group. One of that group's activities is a regular flash fiction challenge - one of the group's artists posts one of their creations, and the writers try to concoct 200 words or so to live up to the work. And that's how this flash fiction piece came to be - as I was intrigued to explore this unusual encounter. Read, enjoy - then check out the links below to find out more about Ian's work. "You're amazing," said Jenna as she cradled the winged being in her hands. "What are you?" A tinny voice chirped back, "I'm an explorer." "An explorer?" said Jenna, "But you're so small! How can you get anywhere?" 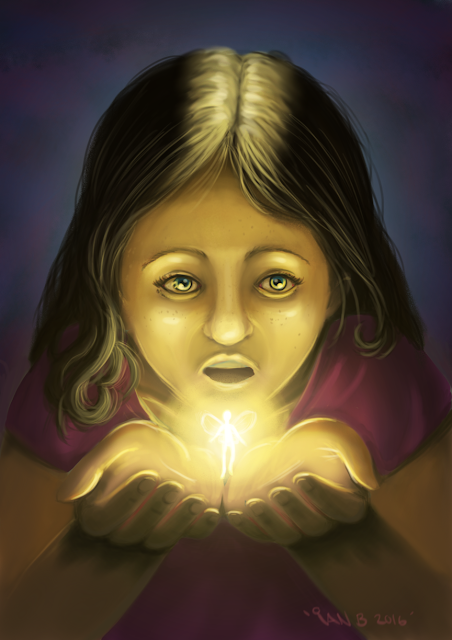 The creature shrugged, and with a buzz and a glimmer of light, the wings on her back fluttered. She raised a little from Jenna's palm, then drifted down. Jenna gasped in shock, the gust of air almost knocking over the tiny figure. Jenna raised one thumb to stop it tumbling over the edge of her hand. "Where do you come from? Are there others like you? Are they tiny too?" The questions came in a rush, until she was halted by the creature raising a hand. "Wait, wait," said the tinny voice, "too many questions. My translator is having trouble keeping up." "It's... it lets me speak to you, it's part of my suit," said the explorer. "But yes, there are more like me. We come from a planet called Earth and - well, you see, we're not tiny. They call this the Planet of the Giants - you're as tall as a... well, we'd call it a mountain. You call it a chair." "And," it said with a tinny laugh, "we come in peace." Or check out his novel, Hunting Darkness, at the link below.